in honour of the martyrdom in Rome of the apostles Saint Peter and Saint Paul, which is observed on June 29. In the New Testament, Peter was a fisherman in Bethsaida and among the first of Jesus’s disciples. The feast is traditionally celebrated by fishermen all over Goa as the festival of Sangodd and marks the start of the ‘rampon’ fishing activity. 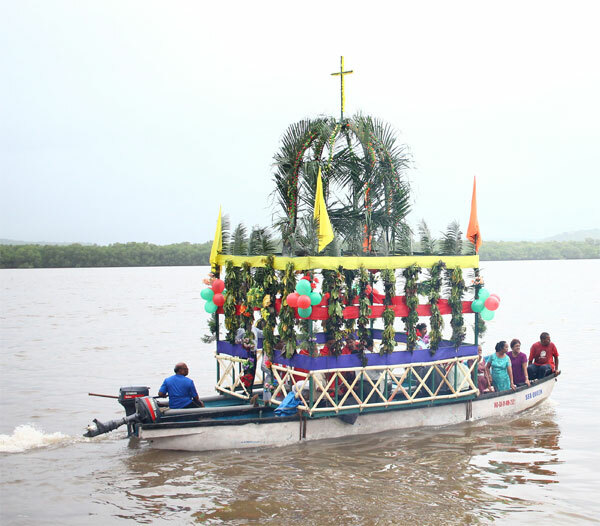 A special stage comprising a decorated chapel is erected atop fishing boats that are tied together. In Candolim, the traditional ‘Sangodd’ festival dates back to over a century and is celebrated with great enthusiasm at the Orda jetty, with an entertainment programme in Konkani. A stage is erected on four fishing boats that have been tied together, with a wooden chapel erected on it, which is used as the stage for the evening of Konkani music and comedy. The tradition of celebrating the festival has been consistently carried forward over generations and their faith in the Saint has only increased over the years. In Ribandar, for over 105 years, the feast of St Peter is celebrated on June 29, when the entire village gathers to seek the blessings of the Saint on the river banks. “Sangodd is celebrated to pray for the safety and bounty of fishermen from Ribandar. The celebrations begin when the Parish Priest of Ajuda Church, Fr Lawrence Fernandes, takes the statue of St Peter in a procession from Ajuda Church, Ribandar. The priest gets onto the two boats that are tied together in the river, along with the brass band. The Sangodd takes a ride in the river right from the jetty opposite the church to the Goa Institute Management, where it takes a turn and comes back to St Peter’s Chapel, which is located in between Solar dos Colaco and Camelot. Holy water is sprinkled on the river to bless it and the fishermen dip their fishing nets into the water and pray for safety and a great catch for the entire year. The hymns of Saints Peter and Paul are sung on the Sangodd. Once back in the church, during the Eucharistic celebrations, some fishermen offer their canoes and motors, sacrificing the fishing for two days, as St Peter is the patron saint of the fishing community and always protects them,” says Michael Fernandes, President of St Peter Chapel, Ribandar. “The evening activities will begin at 4pm when all the villagers will get together for a procession in the traditional canoes in the river known as ‘Traditional Sangodd’. The ride in the river is enjoyed by every member of the community, young and old, to the beats of a brass band. When the canoe heads back to the jetty, the villagers with head for a quick dip in a big well where Sao Joao was recently celebrated with the newlywed couples. The litany is said in the evening at 8pm at St Peter Chapel, Ribandar, followed by dinner. Many local fishermen offer their catch of day for this celebration,” adds Michael.